Given the individualistic nature of Romanticism, we might expect the range of revival styles to be widest in painting, the most personal and private of the visual arts, and narrowest in architecture, the most communal and public. Yet the opposite is true. Painters and sculptors were unable to abandon Renaissance habits of representation, and never really revived medieval art or ancient art before the Classical Greek era. Architects were not subject to this limitation, however, and the revival styles persisted longer in architecture than in the other arts. The late eighteenth century, as we noted before, had come to favor the heavier and more austere Greek Doric over the Roman. This "Greek revival" phase of Neoclassicism was pioneered on a small scale in England, but was quickly taken up everywhere, since it was believed to embody more of the "noble simplicity and calm grandeur" of classical Greece than did the later, less "masculine" orders. Greek Doric was also the least flexible order, hence particularly difficult to adapt to modern tasks even when combined with Roman or Renaissance elements. Only rarely could Greek Doric architecture furnish a direct model for Neoclassic structures. We instead find adaptations of it combined with elements derived from the other Greek orders. The Altes Museum (Old Museum; fig. 924) by Karl Friedrich Schinkel (1781-1841) is a spectacular example of the Greek revival. The main entrance looks like a Doric temple seen from the side (see fig. 169), but with Ionic columns strung across a Corinthian order (compare figs. 165 and 180). The building is notable for its bold design and refined proportions. Schinkel, an architect of great ability, began as a painter in the style of Caspar David Friedrich and also worked as a stage designer before joining the Berlin public works office, which he later headed. Hence, he knew well how to infuse architecture with Romantic associations and a theatrical flair worthy of Piranesi. 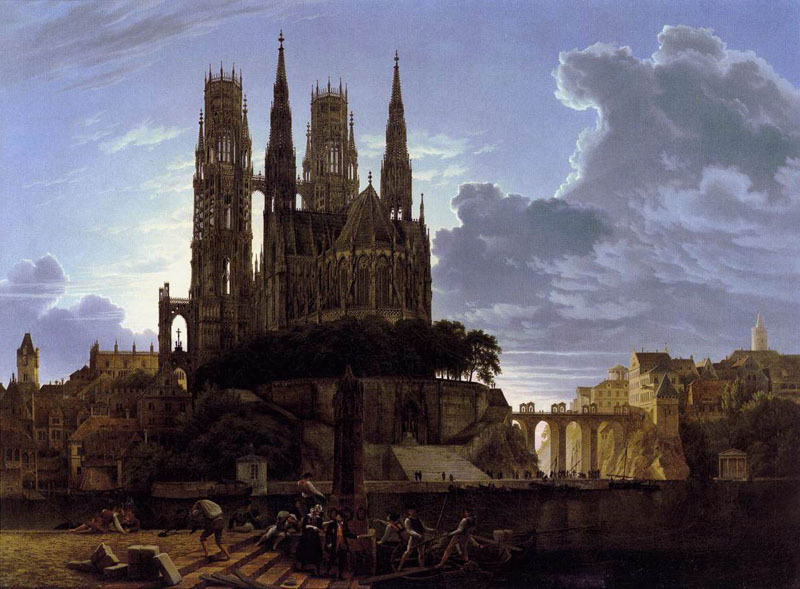 Schinkel's first love was the Gothic, and although most of his public buildings are in a Greek style, they retain a strong element of the picturesque. Here the monumental facade, with its broad expanse of columns, is stretched to an enormous width. The measured cadence is intended to establish a contemplative mood appropriate to viewing art in a repository of antiquities. Schinkel set a precedent that was soon taken up everywhere. He was the first to treat a museum as a temple of the arts. Such an association could find sanction in the classical past: the small pinakotheke (picture gallery) at the entrance to the Acropolis (fig. 176). 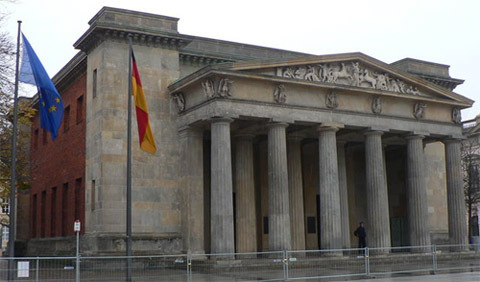 The Altes Museum expresses the veneration of ancient Greece in the land of Winckelmann and Mengs. To the poet Goethe, it remained the pinnacle of civilization. 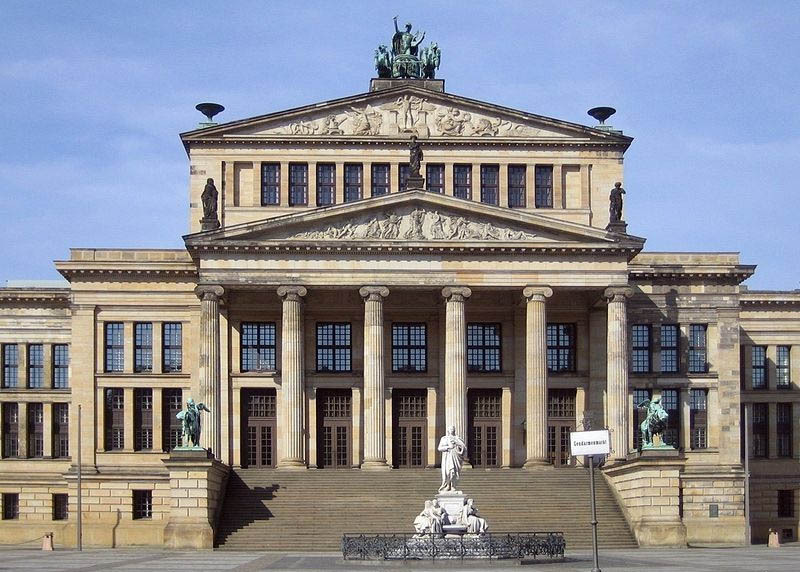 The Altes Museum is, furthermore, testament to the enlightened attitude that gave rise to art museums, galleries, and academies on both sides of the Atlantic during the nineteenth century. At the same time, the Greek style served the imperial ambitions of Prussia, which emerged as a major power at the Congress of Vienna in 1815. The imposing grandeur of the Altes Museum proclaims Berlin as the new Athens, with Kaiser Wilhelm III as a modern Pericles. It is characteristic of Romanticism that at the time architects launched the classical revival, they also started a Gothic revival. England was far in advance here, as it was in the development of Romantic literature and painting. Gothic forms had never wholly disappeared in England. They were used on occasion for special purposes, even by Sir Christopher Wren and Sir John Vanbrugh, but these were survivals of an authentic, if outmoded, tradition. The conscious revival, by contrast, was linked with the cult of the picturesque, and with the vogue for medieval (and pseudomedieval) romances. German architect and painter whose Romantic–Classical creations in other related arts made him the leading arbiter of national aesthetic taste in his lifetime. The son of an archdeacon, Schinkel studied architecture with the brilliant Friedrich Gilly (1798–1800) and at Berlin's Academy of Architecture (1800–02), followed by several years in Italy. 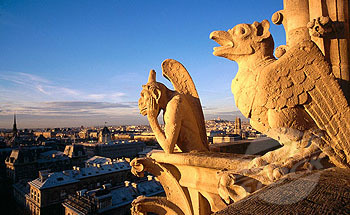 Returning to Berlin via Paris (1805), he became a painter. He designed furniture for Queen Louise in 1809 that, with its rich, light-coloured pearwood, play of matched grains, and romantic simplification of form in a classical milieu, anticipated the forthcoming Biedermeier period. 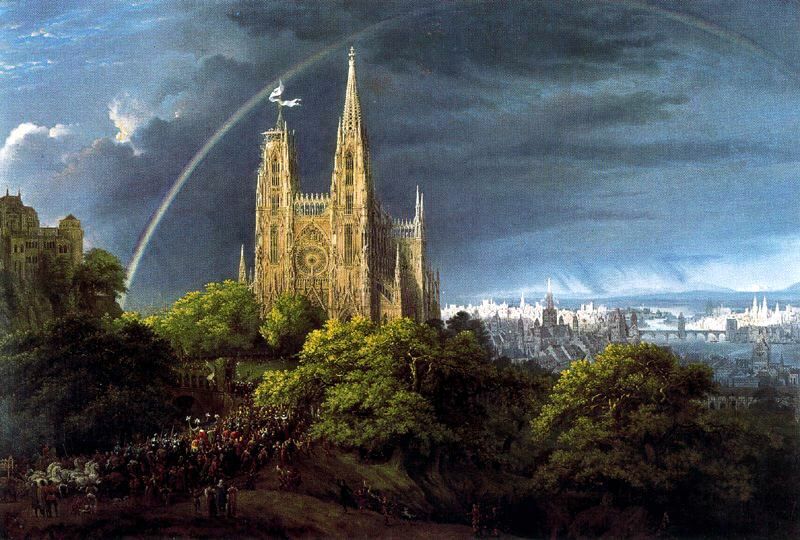 In 1824 Schinkel visited Italy again and in 1826 travelled through Scotland and England. Appointed director (1830) of the Prussian Office of Public Works, he decorated apartmentsfor Crown Prince Friedrich Wilhelm and Prince August. His work as a city planner resulted in new boulevards and squares in Berlin. Also remembered for his stage and ironwork designs, he designed scenery for Goethe's plays, bathing the whole stage in an atmosphere of picturesque illusion. 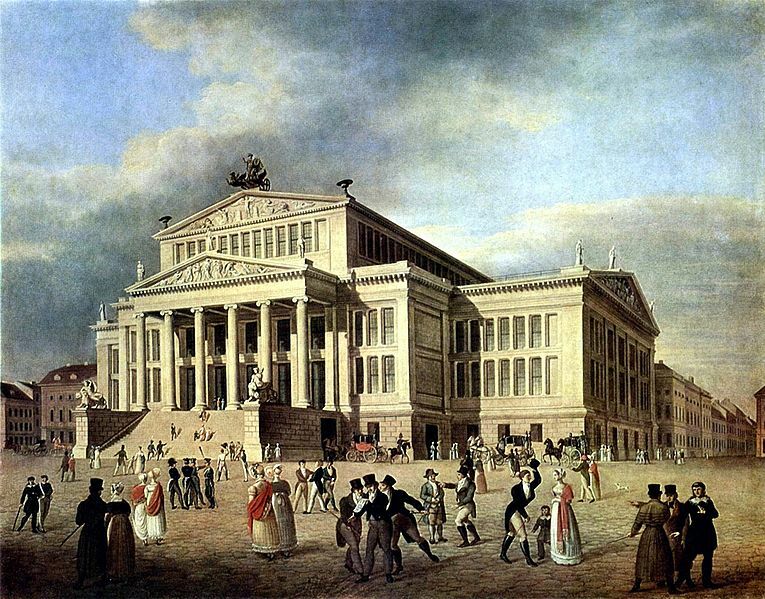 Schinkel's Neues Schauspielhaus ("New Theatre"), Berlin; now the Konzerthaus Berlin. In this spirit Horace Walpole (1717-1797), midway in the eighteenth century, enlarged and "gothicized" his country house. Strawberry Hill (figs. 925 and 926), a process that took some two decades and involved his circle of friends (including Robert Adam, who was responsible for the round tower). On the exterior, the rambling structure has a studied irregularity that is decidedly picturesque. Inside, most of the elements were copied or faithfully adapted from authentic Gothic sources. The screen in Holbein Chamber (fig. 926) is derived from a gate at Rouen, while the chimney is related to a tomb in Canterbury Cathedral. Although Walpole associated the Gothic with the pathos of the sublime, he acknowledged that the house is "pretty and gay." The dainty, flat surfaces remind us strongly of Robert Adam (compare fig. 874): the interior looks almost as if it were decorated with lace-paper doilies. This playfulness, so free of dogma, gives Strawberry Hill its special charm. Gothic here is still an "exotic" style. It appeals because it is strange, but for that very reason it must be "translated," like a medieval romance, or like the Chinese motifs that crop up in Rococo decoration.